Pine Lake Park is one of the city’s least dense neighborhoods, with fewer than 275 homes. This neighborhood is a primarily outdoor experience, and a charmer at that. The residential portion of this neighborhood is densely packed into its western corridor as well as across its southern border along Sloat Boulevard. Development was ignited in this area in the 1920s, but the neighborhood itself was not completed until much later. While there are no large commercial hubs within the neighborhood’s borders, residents need only travel a few blocks over to Stonestown Galleria where everything imaginable is available from restaurants, large department stores and smaller storefronts, a movie theater, and direct access to the city’s Muni metro lines. Really, Pine Lake Park is all about outdoor recreation. The famed Stern Grove is within its borders, known for its summer entertainment including a legendary free concert series. Pine Lake itself boasts a number of trails and green spaces for residents to enjoy. The homes in Pine Lake Park are mostly detached, single-family abodes, all of which sit on moderate-sized lots. With the utilities underground and the consistent image of neatly manicured lawns, the neighborhood projects an overall sense of cleanliness and order. Housing styles vary from classic to ranch-style, including large portions of row houses. The homes running along Crestlake Drive have the added amenity of backing directly up to either the park or Stern Grove. 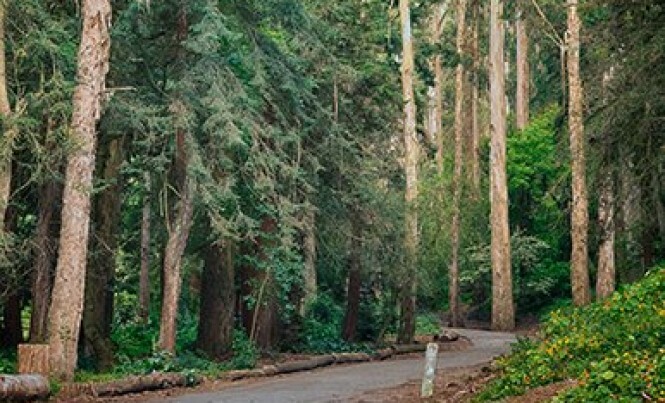 Known more for Stern Grove than its affluent and tidy residential quarters, Pine Lake Park is a truly classic San Francisco neighborhood not entirely on everyone’s radar.